A middle level adjudicatory body met at the Big Spring Mennonite Church, March 9, 2015. The Northern District Council, consisting of around 25 representatives from about a dozen churches in the Virginia Mennonite Conference, welcomed a new congregation, heard overseers reports, and listened to a mission worker present new ideas for church growth. Friends took a hike on the newly developed Bluestone Trail in Harrisonburg, Virginia. 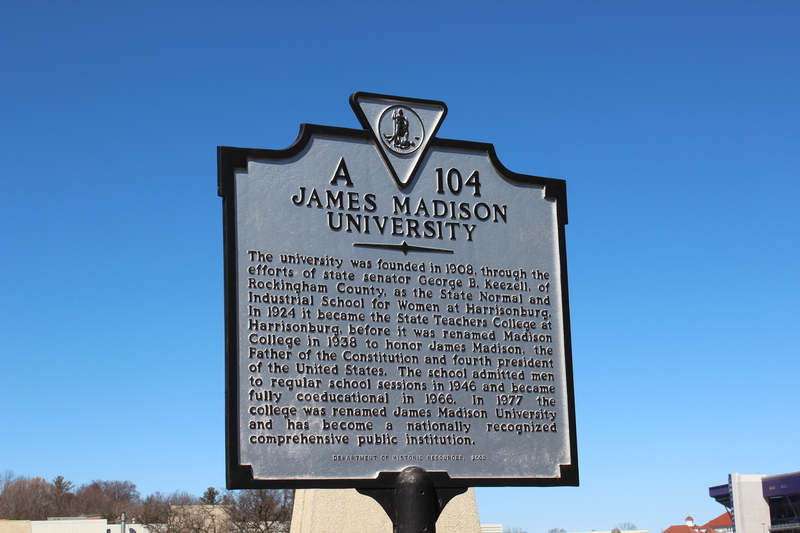 The trail is a function of the city of Harrisonburg and the sprawling and growing comprehensive university that dominates the landscape in the friendly city. Hikers and bikers shared the trail on a sunny day, which all revolved around the fourth president’s namesake school, an outstanding institution in the heart of the Shenandoah Valley of Virginia. 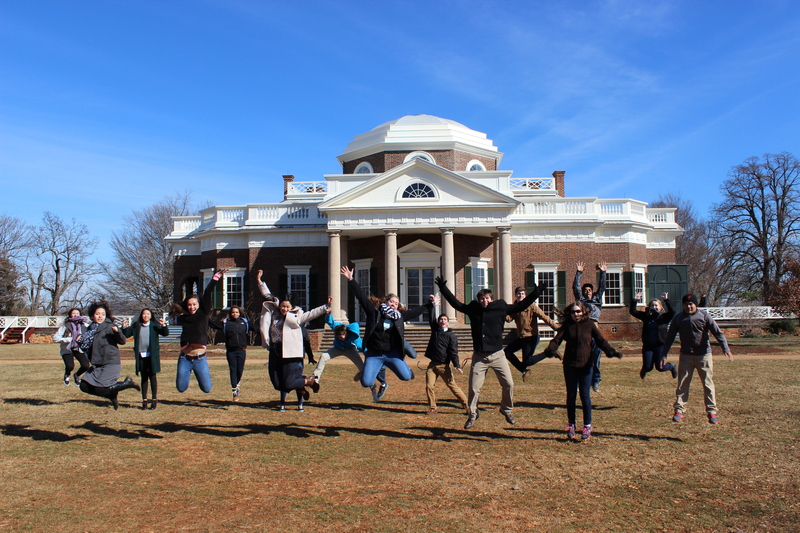 The history teacher recently took fifty-five students to Charlottesville, Virginia, to take a one hour tour of the distinguished University of Virginia, and then a three hour tour of the outstanding mansion and grounds of Jefferson at Monticello. The students were challenged by Jefferson’s vision for America, his determination to stand for religious freedom, and his inventive genius. The Historian found a Mennonite meetinghouse on Mutton Hollow Road, Greene County, Virginia, on a recent forray off the Skyline Drive. Established as a mission station by the Middle District of the Virginia Mennonite Conference in the early 20th century, the church today, Mt. Hermon Mennonite, is a part of the Southeastern Mennonite Conference. Recently the Historian visited the site where Northern Officer John Meigs died during the Civil War. His death nearly caused the burning of Dayton, but it did result in many barns and other structures being burned by Union troops in the surrounding area. 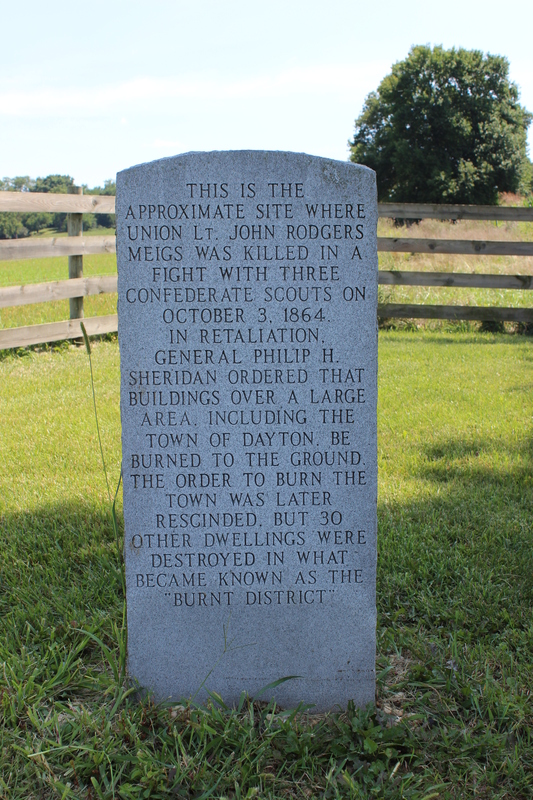 Meigs’ marker is one evidence that remains of the terrible burnning of over 400 barns, over 30 mills and around 30 houses by Union forces during the Valley Campaign of 1864, in the Shenandoah Valley of Virginia. 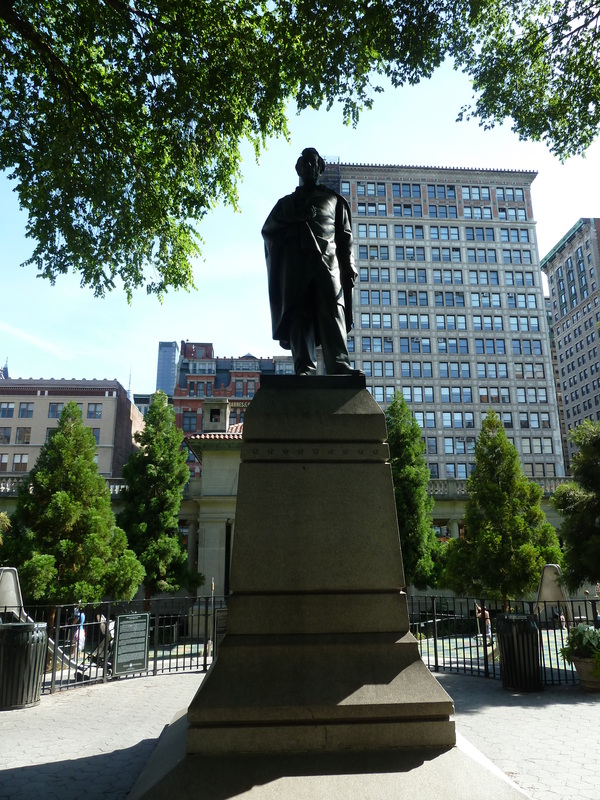 An effigy of President Lincoln presides over the busy Union Square on Manhattan Island, New York City. Union Square appropriately hosts the 16th president, watching over a bi-weekly farmer’s market, artists, protesters, and youth on skateboards. A Virginia historian recognizes his legacy in terms of the Shenandoah Valley Burning in 1864, but nevertheless Lincoln kept the Union together, for which we are grateful. 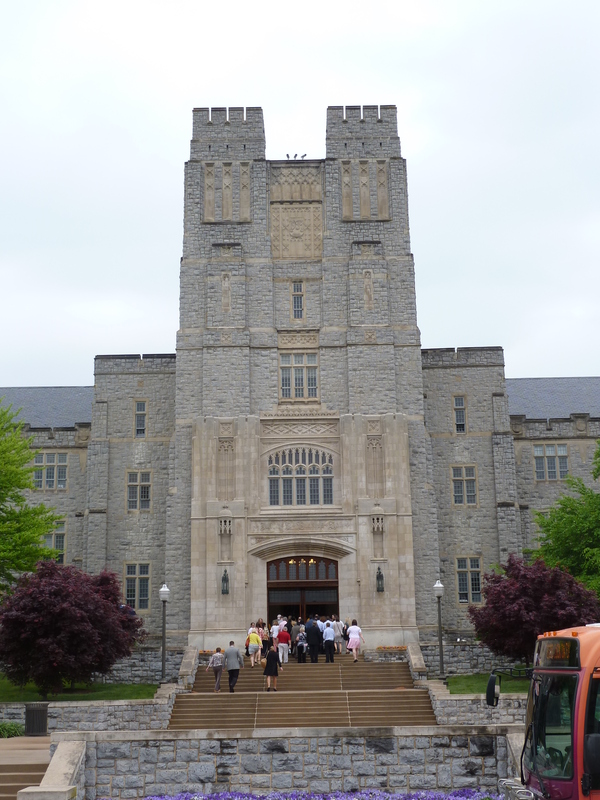 Burruss Hall at Virginia Tech, Blacksburg, Virginia, was the site for a recent family graduation from medical school. The storied Hall holds up to 3000 people, and on this day for the Virginia College of Osteopathic Medicine 2014 graduation, it was full. Virgina Polytechnic Institute and State University is an outstanding institution of higher learning in southern Virginia. 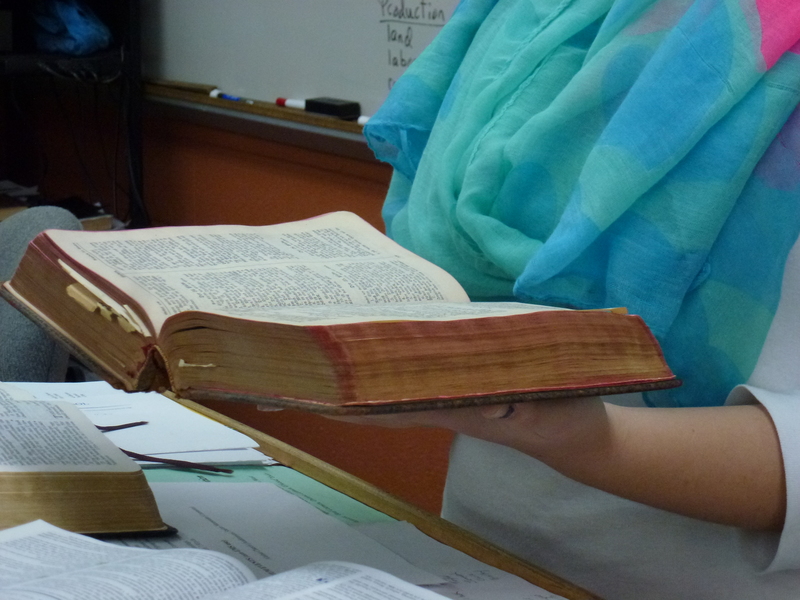 An Eastern Mennonite High School exchange student from Paraguay read Psalm 23 in German from Simon L. Yoder’s German-English Bible, March, 2014. Beachy Amish Minister Simon L. Yoder, the Historian’s grandfather, lived 1902-1993, and the German Bible was given to Simon’s grandson. The student was enrolled in the Historian’s Global Christianity class. The Information Superhighway has changed schools. In the 1970s high schools had books, magazines, and traditional libraries. Today students can access a world of resources on computers in their classrooms. The Kennel Charles Church History desk (right), with Martyrs Mirror on the top shelf, hosts a state-of-the-art computer that brings information to the student in the history teacher’s classroom at Eastern Mennonite High School, Harrisonburg, Virginia. New bridge over Linville Creek replaces 1898 wrought iron truss bridge that many Broadway, Virginia, residents, including Mennonites, used in early 20th century, a photo by MennoniteArchivesofVirginia on Flickr. Mennonites in the Northern District of Virginia Mennonite Conference often used this old iron bridge to head west towards mission stations in the West Virginia highlands. Today a modern bridge over the steady Linville Creek reduces the 1898 bridge to a foot and bike path. The old bridge in Broadway, Virginia, is on the National Register of Historic Places in Virginia.